Indo-Pacific lionfish, Pterois spp., have established themselves in the western Atlantic Ocean, Gulf of Mexico, and Caribbean Sea. These invasive fish pose a serious threat to marine ecosystems. 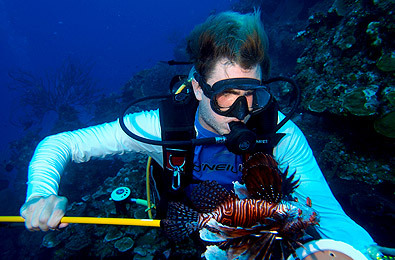 To date, the most effective technique for removing lionfish is spearing while SCUBA diving. Local scientists, dive operators, and volunteers have conducted weekly lionfish culls around Little Cayman since 2011. Overall, these targeted lionfish removal efforts have been successful at lowering lionfish populations in Little Cayman. In addition to reduced numbers, lionfish size distribution is shifted to smaller size classes in culled sites compared to unculled sites. However, there are differences in population densities and replenishment rates around the island that should be incorporated into future culling plans. This web map provides the most up-to-date lionfish culling information for Little Cayman. The map legend can be toggled on/off by clicking the arrows in the upper left corner. Shaded areas represent culling zones, with green areas having low average lionfish catch and red areas having high average catches. Click on an individual zone to display information about the area. Zoom in further to display individual dive sites, and click on a site to display information about that specific site. View this map in full screen on the ArcGIS Online website here. If you have culled lionfish on Little Cayman, please submit your culling data through this form, so that it can be included in our web map. Map 1 of Little Cayman show the average number of lionfish encountered (per diver per hour) across different areas combining data collected for 2015 and 2016. 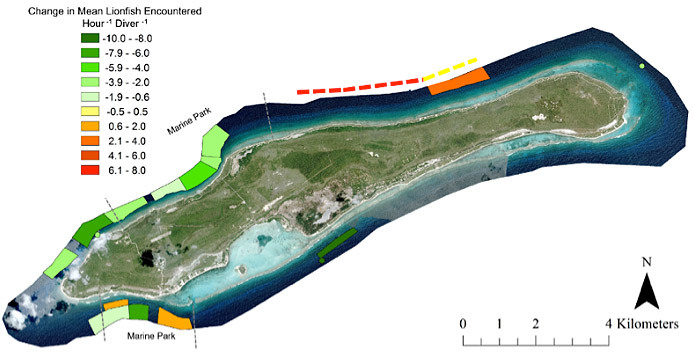 Sites inside Little Cayman’s marine parks were the primary focus of the community culling programme for its first three years; lionfish populations in these areas have decreased since this targeted initial effort, and remain low with continued removal efforts. Despite a similar effort during recent years to target the northeast portion of the island, lionfish numbers on these sites are equivalent to or greater than sites that have been unculled since 2011 (starred). Map 2 displays change in the average number of lionfish encountered at each site group comparing 2012-2014 to 2015-2016. The dashed lines on the northeast side of Little Cayman represent the change in lionfish encountered here between 2015 and 2016. 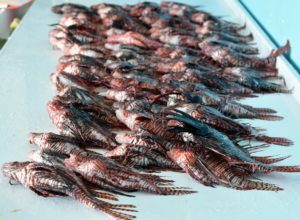 Increases in the number of lionfish encountered in these areas are likely the result of increased culling efforts. The successful removal efforts inside Little Cayman’s marine parks can clearly be seen on the western half of the island. MAP 3 shows the total number of lionfish removed per area for the years 2015 and 2016. The numerical values inside each area indicate the total number of culls that occurred in that area during that time period. In 2015 culling efforts were redirected towards the northeastern side of the island to increase culling effectiveness and manage lionfish populations outside the marine parks. Map 4 shows the total number of lionfish removed per area for the years 2012-2014. Most lionfish removed during these first three years came from the western areas of the island, particularly from Little Cayman’s marine parks.